Due to inclement weather, the Eight Annual Applied Sciences Career Fair has been re-scheduled for March 18th. OXFORD, Miss. – Most than 30 potential employers are set to be on hand for the University of Mississippi’s School of Applied Sciences annual career fair, coming up March 18th at the Inn at Ole Miss. “This is the most vendors we’ve had since the first fair in 2008,” said Teri Gray, coordinator of the Applied Sciences Career Fair, which runs from 10 a.m. to 2 p.m.
Career vendors will be available to meet and advise students from departments such as Legal Studies; Social Work; Communication Sciences and Disorders; Nutrition and Hospitality Management; and Health, Exercise Science and Recreation Management. This year’s vendors include the Federal Bureau of Investigation, Mississippi State Department of Health, St. Joe Club and Resorts, and Oxford Health and Rehab. The career fair is a great way for students to network with professionals and gain information about employment options. After the event, a networking reception begins at 4 p.m. Students are welcome at the reception, which will include the presentations of the Thomas Crowe Alumnus of the Year award and the Linda Chitwood Student Merit award. The event not only offers career opportunities, but allows employers to meet talented students completing their degrees, said Velmer Burton, dean of the School of Applied Sciences. 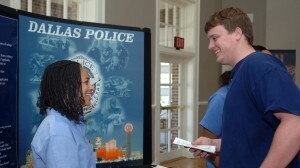 For more information about the Applied Sciences Career Fair, contact Teri Gray at twgray@olemiss.edu or 662-915-7901.